Wild tomato species are not edible, but they can be bred with domestic tomatoes to introduce new traits such as flavor and drought resistance. A new genome sequence for wild... The genome of Solanum pennellii, a wild relative of the domestic tomato, has been published by an international group of researchers including the labs headed by Professors Neelima Sinha and Julin Maloof at the UC Davis Department of Plant Biology. The new genome information may help breeders produce tastier, more stress-tolerant tomatoes. The work, published July 27 in the journal Nature Genetics, was lead by Björn Usadel and colleagues at Aachen University in Germany. The UC Davis labs carried out work on the transcriptome of S. pennellii — the RNA molecules that are transcribed from DNA and then translated into proteins — messages written from DNA and taken to other parts of the cell to tell it what to do. Analyzing the RNA transcriptome shows which genes are active under different circumstances. 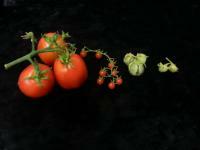 The UC Davis team published a paper last year comparing the RNA transcripts of domestic tomato and three wild relatives, including S. pennellii. S. pennellii is inedible, but it can be interbred with domestic tomatoes to introduce useful traits, such as drought resistance. Using the new genome data, the researchers found genes related to dehydration resistance, fruit development and fruit ripening. They also found genes that contribute to volatile compounds related to fruit scent and flavor. Page took 0.015547 seconds to load.